Once goals have been set in Coach, both managers and employees are asked to rate performance on a regular basis. You'll get a notification email on Mondays depending on your rating cadence and it will inform you that it's time to rate your goals. Both employees and managers go through a similar process to review goals and give feedback, and you'll each get a side by side comparison of your ratings once you're both finished. In order to keep the rating process unbiased, both managers and employees must submit their own ratings before the other's are revealed. Goal ratings themselves aren't available to the other person until both have submitted their feedback. The reason why comments are immediately visible and ratings are not is because the goal rating process should be unbiased, yet informed. Managers are busy (aren't we all? ), so with multiple direct reports and an infinite amount of tasks to attend to every day, Coach helps managers make an informed rating and give well informed coaching feedback before 1:1 conversations take place. Any comments provided by the manager or the employee are immediately visible to the other to give the information needed to make an accurate rating. Note that once the rating period closes, ratings are revealed if both haven't been submitted. So there may be times where one person rates and the other doesn't, but the evaluation can still be viewed for historical reference. Know that you're always rating your past performance. For example, if your company rates goals weekly, you'll get the "Time to Rate" email on Mondays and you'll rate performance for the week before. The same with bi-weekly and monthly cadences. Always be reflecting back on the past time period when evaluating performance. Example: My organization rates goals weekly. My "Time to Rate" notification email is delivered on Monday, August 8th, 2016. In the rating process, I'll evaluate my performance for the week of Monday, August 1st - Friday, August 5th. The next rating cycle begins and I get my "Time to Rate" email on Monday, August 15th, 2016. I'll rate my goals based on my performance from Monday, August 8th - Friday, August 12th. Coach is a tool for employee coaching and development. In order for managers to give feedback as effectively as possible, employees' comments, roadblocks, and to-do lists are shown to managers before they provide their own ratings and coaching feedback. We recommend that managers set a standard with their team and request that employees rate before a certain time. 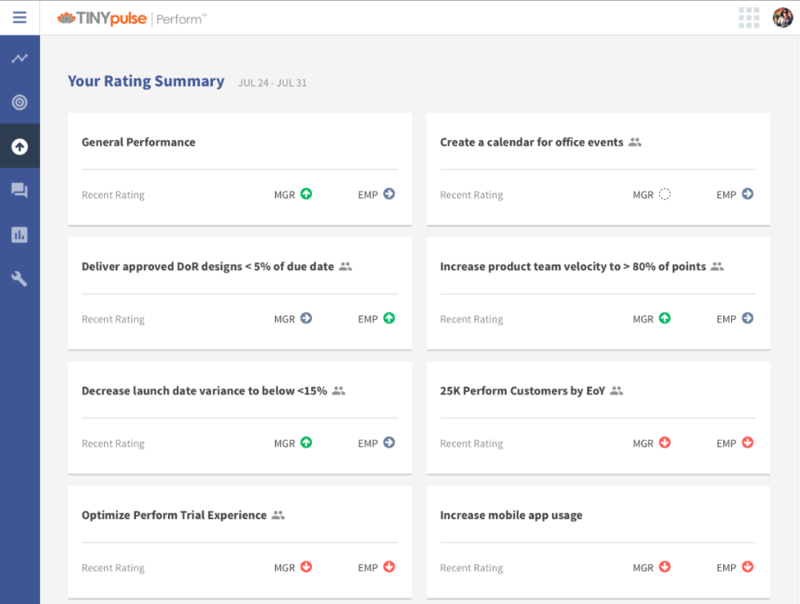 At TINYpulse, employees are asked to rate performance before 12:00pm on Mondays so managers can go in and rate after that. Rate performance on the goal. Write comments to justify your rating. Give feedback depending on your role. Employees: Notify your manager if there are any areas in which you need support. Managers: Give insights and coaching tips to help your employee improve. Try to be as thorough as possible in your ratings in case of disparities and misalignment between manager and employee. Also, providing sufficient details helps facilitate 1:1 meetings. If you've taken a few minute to prepare by using Coach, you can spend time discussing other issues that may be concerning you. 1:1 meetings become productive discussions instead of just status updates. TINYpulse Coach lets you rate goals on three levels: At, Above, and Below expectations. It may take some time for managers and employee to align on what level of performance is At, Above, or Below expectations, so use these guidelines to start and visit this article to learn more about setting rating standards. Below expectations: The objectives and targeted tasks for the rating period weren't achieved. Performance for the rating period was lower than expected and there's a lot of room for improvement. At expectations: The objectives and tasks for the rating period were achieved and completed sufficiently. Performance met expectations although there may be ways to improve. Above expectations: Objectives were surpassed. Performance and results turned out better than expected and there is little that could have been done to make performance better than reality. And don't forget! Rating performance is just one small part of the process. The real value lies in your comments so make sure to write details to support your rating in order to deliver or receive valuable coaching feedback. Coach lets your create To-Do items at any time in the goal's lifecycle. Some people like to load all of their to-dos in at the beginning, and some prefer to list them out for each rating period to set their objectives for the week. Work with your manager to decide which method works best for your goals. Incomplete to-do's are carried over week over week so tasks never slip through the cracks. Once you complete a to-do, it will appear in the goal's history for the rating period that you ticked it off. When your managers rate their employees' goals, they can see which to-do's have been completed that period and those that are still outstanding so they're able to stay up to date on progress. To make things even easier, integrate your Coach to-do list with Wunderlist to keep your goal tasks at the forefront of your mind in between rating periods. Not all goals are created equal and need to be rated each week. And some organizations prefer to not rate at all, while still using Coach as purely a coaching and development tool. That's why rating is optional and you can skip a week (or an eternity) if that works for you and your employees. Add coaching feedback and to-do's to a goal whenever you'd like, but you can leave the actual goal rating blank and simply move to the next one. Rating skips do not affect alignment, but be sure to agree on these skips prior to the rating week. If you're done with rating but are still waiting for the other person to rate their goals, give them a Nudge to let them know you're waiting. They'll get a reminder in their inbox and on their mobile phone to rate your goal. Just go to your dashboard, click on the goal in the Active Goals panel, and select Nudge. Now that all of the data is in Coach, it's time for your 1:1 meetings. A good starting point is to use the Rating Summary. This page displays a side by side comparison of both manager and employee ratings for that particular rating period. The first thing to check for are disparities. If there's a situation where the employee rated themselves above expectations and the manager rated below, or vice versa, clearly there is a communication issue. Click on the goal itself to open the details and realign.